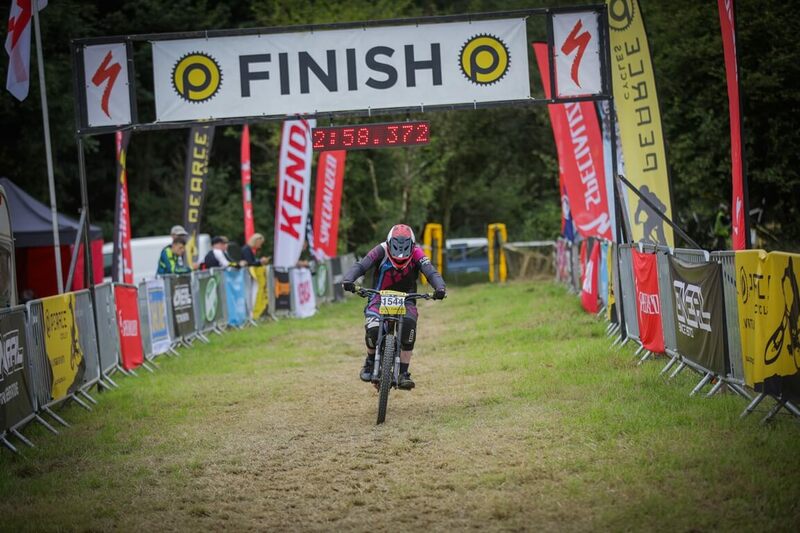 Round 5 of the Pearce Cycles downhill series was held at Hopton on Sunday 13th August. This was Kate’s first time at a Pearce race and the longest track she’s raced, here’s her race report. This weekend was to be my first Pearce experience, I joined in with round 5 of the Pearce Race Series and English Championship held at Hopton Woods in Shropshire. It’s also my first visit to Hopton Woods, so I didn’t really know what to expect of the track. As I pulled up Friday evening in my van I was surprised to be greeted by the friendly faces of guys and gals I have met through the Forest of Dean Mini Downhill and Racers Guild Series at Cannock Chase – boy did that feel good, for some reason the nerves were already getting to me so it was quite a relief to have people I knew around me. I set my van up for the weekend and off we went for a track walk. The first thing that struck me was how long the track was compared to what I’m used to racing. It was very twisty, dusty, loose, jumpy, rooty and steep in places. Basically a bit of everything, the kind of track that if I wanted to try and attack it fast I’d need to be on my toes and riding at my best! Saturday morning and my first run down the track was rather tense and uptight, I wouldn’t let the bike go and I felt every root, bump and drop in the ground. I’m sure everyone has been there? You actually feel like you’ve forgotten how to ride your bike and think ‘What on earth am I playing at’. Lack of confidence and nerves can have a big impact on how I ride my bike, I won’t send a jump I’d sent before, or I won’t attack a corner with the same aggression and let the bike go – it can be quite annoying but hey ho, we have to get a grip and deal with it. Jumping on the uplift I pulled myself together for another practice run down and I felt much better on the bike. My grin soon returned and I started to enjoy the track and get looser on the bike. I was enjoying it so much so I was letting the bike go a little too much, I’ve never had so many offs in one day in my life! Most of them quite comical and much to my friends amusement; I’d be chatting away and next minute I was over the bars, down the bank or hugging trees. I can’t count the amount of times I slid into the same tree before the drop. I feel sorry for the tree – the main thing was we were enjoying ourselves! Sunday morning soon arrived – I’d not had much sleep over the weekend and the nerves were still getting to me, but I managed my new lines so I was pretty pleased with that. My last practice run down was a little kamikaze, the track had been closed for a considerable amount of time whilst attending to a fallen rider. Meanwhile the queue at the top of the track was getting quite long but I couldn’t help but note there were far more ants than people crawling around (not that we were crawling around or anything). What were all those ants about? The floor was moving with them I swear and they were massive, they looked like termites, you couldn’t put anything down and god forbid if you fell off and took a while getting up, the critters were all over you uuugghhh! Not that I’m being a pansy about it 🙂 Once the track was reopened and we got the go ahead I knew this would be my last run before the race, I didn’t crash but I had to stop for a red flag, I’m pretty sure at this point I hadn’t managed a complete run down from top to bottom but it didn’t worry me too much. Lining up for my race runs my nerves were now running wild, I watched one of my friends standing like a super hero haha! You know what it works – stand like a super hero, feel like a super hero, act like a super hero ‘I’m going to smash this run and if I fall off I’m going to get up like a super hero and crack on like one! What a legend! We’re so lucky to have such a great bunch of girls that race, they all bring something different to the group to make you smile and have a great time, even when the nerves are sky high! It was soon time for my first run down the track, the first corner had become very choppy and loose and I took it with a bit too much caution, I needed to get some speed up but I couldn’t get a second between roots and small drops to re adjust my foot on the pedal to get some cranks in. The good thing about these longer tracks is you can really settle into your run and you have time to make up for smaller mistakes. I managed to get into my flow and enjoy the track, I didn’t tense up too much and guess what? I managed a clean run down to come in at a respectable 6th place. I’m really liking the longer track, I think my fitness has helped a lot with my timed runs although after all the adrenaline I was feeling a little tired on the last section of my second race run. I managed a great save with a dab to stop me wrapping myself around a tree, to the applause of some spectators phew! That was a close shave. Battling my way over the line I had come in with a slightly quicker time but moved down to a still very respectable 7th place. I was so chuffed with my first Pearce race and to ride with a fast and talented group of girls, I feel like I’ve learnt a lot. The event was so well organised, it was nice having an uplift service, there’s help on hand with any bike problems. Jake from Sprung Suspension did a great job getting my rear shock feeling more planted with a few tweaks. After my first taster I’ll definitely be back for more of the Pearce scene, It’s also opened my eyes to book in on some uplift days over at Hopton and other areas as I know it will help my riding massively! Thanks to Flow for their continued support looking forward to the next race meet! Next post: Rehab; a long road with large sections of going nowhere!